A car blasts through a flooded wash, in violation of the state’s Stupid Motorist Law, in Cave Creek, AZ (top photo). It’s rained this week in Phoenix. Normally a little rain in January is not a big deal here. But this week has not been normal. So far this week we’ve had about five inches of rain. We usually get about eight inches of rain in a year. So this week’s five inches has been a big deal. In fact, if you watch local television or listen to local radio, you’re pretty much assured it’s a sign of the coming apocalypse. The coverage blew past hysterical way before it even started raining. We’re in full blown panic mode now. In Phoenix and its environs, it’s rain. In the “high country,” the parts of Arizona above the Mogollon Rim, it’s snow. As of Thursday night, Flagstaff has gotten about four feet of snow (in four days) and is effectively closed. The highways from Phoenix to Flagstaff are closed until Friday afternoon and Northern Arizona University is closed until next week. The area’s ski resort is open, but because of the snow no one can get to it. We’re supposed to get more rain (and the rim country more snow) tonight. Phoenix may experience 45-50 mile per hour sustained winds. Big fun. 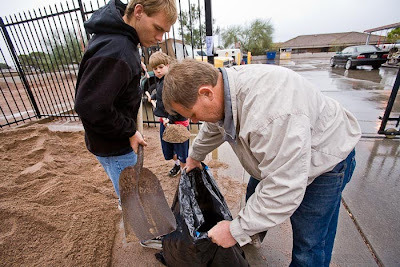 The other photos: family fills sandbags at a Phoenix fire house. The Phoenix Fire Department provided free sand for sand bags to help home owners prevent flooding. 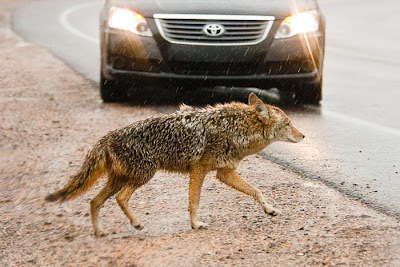 Bottom, a sodden coyote crosses a road in front of a car in Cave Creek. 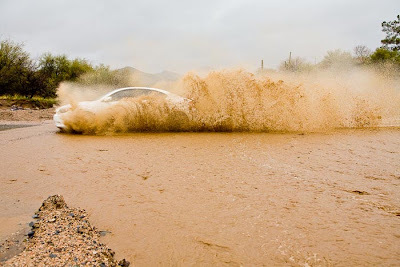 And it’s called the “Stupid Motorist Law” because some folks (who should really know better) insist on driving through flooded washes, getting stuck and needing difficult and expensive rescue. A “stupid motorist” ends up paying for his or her rescue, which could be more than $2,000.